Rollerblade Macroblade ST 90 Men - The Skate was equipped in 2016 with 4x 90 mm wheels, with a wheel hardness of 85a, as well as a fast-SG 9 ball bearing. The skates were re-equipped with 3x lacing. With ratchet strap, Velcro, and a normal lacing. The convenient and easy for skating 90mm men Inline Skate of Rollerblade in 2016, is also equipped with a long 280 mm long frame. The perfect fitness skate for Rollerblade enthusiasts. 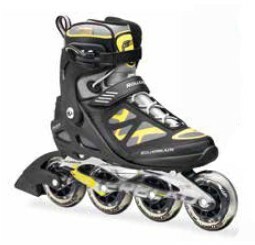 The new 90mm fitness inline skates from rollerblade with a 28 cm long frame, and SG-9 bearings. Also a very comfortable 5-star liner with a great insole adorns the inside of these inline skates. With a 45 ° Velcro, ratchet strap, and a normal lacing You can lace up the fitness skates of Rollerblade.